Hello, I have the stock standard seats in my GLX 83 5.0. Here is my question. Is the frame of my seat the same as the frame for the sport seats? Can I remove my foam and seat cover, and replace with the sport foam and a sport seat cover? Will that work? Thank you. 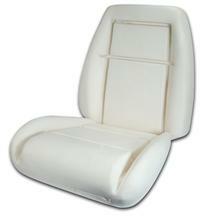 If your car still has the factory GLX seats then yes, these will work. GLX seats shared the same seat frame as the 83 GT without pull out knee bolsters.